Go to visasavingsedge.com, enter your card number and complete the form. Use your enrolled debit card at participating merchants after you receive your enrollment confirmation. Use Visa SavingsEdge on the go with the mobile app. It shows you where to shop and save as a Visa SavingsEdge member. Save on business services, office supplies, dining and entertainment, travel services, and automotive services with your Visa debit card. Just visit visasavingsedge.com for a complete list of participating merchants and start saving today. 1Discounts provided as credits on account statement. Visa SavingsEdge is an automated discount program offered by Visa U.S.A. Inc. to eligible businesses and their authorized cardholders that hold an eligible Visa Business card and whose enrollment in the program is accepted by Visa. Under the program, cardholders can receive discounts from participating merchants each time the cardholder uses an enrolled Visa Business card to make qualifying purchases of goods or services pursuant to an active discount offered by the merchant and that transaction is processed or submitted through the Visa payment system (a “Qualifying Purchase”). Visa may modify, restrict, limit or change the program in any way and at any time. Visa reserves the right at any time to cancel the program. Visa also reserves the right to suspend or cancel any cardholder’s participation in the program. Enrolled cardholders will only receive discounts for qualifying purchases that are in full compliance with the terms of the applicable discount offer. Discount offers may be subject to additional terms and conditions. Discount offers may be removed from the program at any time and are subject to availability. Discount offers are also subject to any applicable law or regulation that may restrict or prohibit certain sales. Discounts will not appear on a cardholder’s receipt at the point of sale. Discounts are provided in the form of credits posted to the cardholder’s applicable Visa Business card account. Please visit www.visasavingsedge.com for complete details on the program, including the program terms and conditions. Register today start earning rewards. 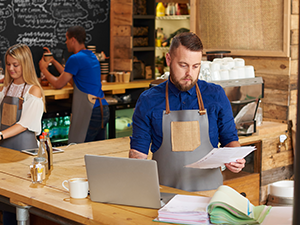 We have the perfect checking accounts for your small business.